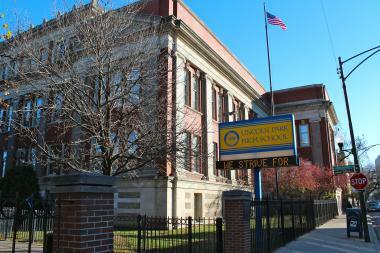 Lincoln Park High School is getting $20 million in renovations over the next two summers. LINCOLN PARK — The $20 million renovation is underway at Lincoln Park High School. The major renovation, announced by Mayor Rahm Emanuel in November, is getting started with a permit for $13.5 million work this summer at the school, 2001 N. Orchard St.
"We're excited about all of it," Principal Michael Boraz said Tuesday. "Infrastructure is not generally something you get excited about. But when you have an older building it's nice to have all the necessary repairs." The Freshman Building is getting tuckpointing, new floors, a new coat of paint and air conditioning. "I'm just really looking forward to how nice the Freshman Building is going to look when it's all done," Boraz said. "You know how the 1960s look wasn't the most aesthetic look for schools, and that's when the Freshman Building was done. So it'll have a nice, modern, clean, bright look when it's all finished, and we're really excited about that." 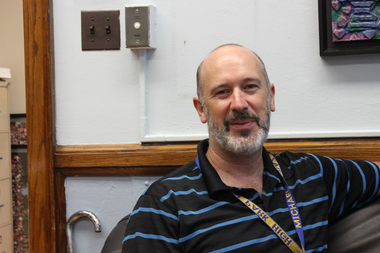 Lincoln Park High School Principal Michael Boraz says the school's upgrades are keeping pace with its improved academics. It should be done in time for freshman orientation before the school year begins. The main building, meanwhile, is having the air conditioning installed as the tuckpointing is done in work that will extend into next summer. But there are also improvements, including a new "distance learning lab" Boraz described as a "flexible computer room" that will accommodate virtual seminars and the like, as well as a new drama workshop. "The drama workshop is something I'm especially excited about, because even though we've had a very strong program for quite a while, it's basically all kind of squished together into one classroom," Boraz said. "So now they'll have a classroom section and then they'll have a workshop section." Boraz added that some new video equipment would get thrown in as well, along with the capacity to design and construct theater sets. "It'll be a really nice upgrade for that program, and it's well-deserved," Boraz said. In some ways, that's the theme of the entire project. The football team, which made an appearance in the state playoffs in the fall after an 8-1 regular season, and the rest of the athletic program is getting a new weight room after the floor sagged under the old one. "We've got good equipment, we just didn't really have the right place to put it," Boraz said. Overall, the school is getting an upgrade to keep pace with its academic achievements after placing in the top 10 high schools in the state in the most recent rankings by U.S. News & World Report. "I'd still say we're maybe a little bit ahead in terms of academic progress compared to the physical school plan," Boraz said. The $20 million came out of a $250 million Chicago Public Schools tax levy for capital improvements that was part of a state budget compromise last summer. Boraz said the school could make additional upgrades and even expand if granted the additional resources. "That's just a dream right now," he said. "But it can't hurt to dream."